The U.S. Southeast is in the thick of a major ice storm -- part of a system the National Weather Service has called "potentially catastrophic." 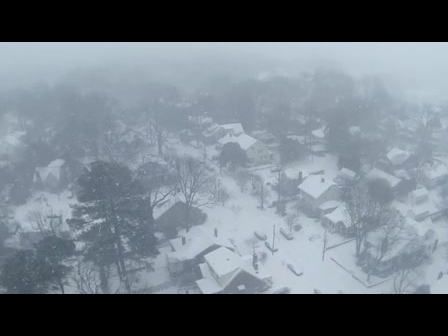 The Piedmont area of North Carolina appears to be bearing the brunt of the storm's effects after temperatures dropped rapidly at mid-day and snow began falling at a furious pace. The gridlocked interstates clogged with abandoned cars and commuters trying to make their way home is drawing comparisons to the weather debacle that happened in Atlanta just two weeks ago. 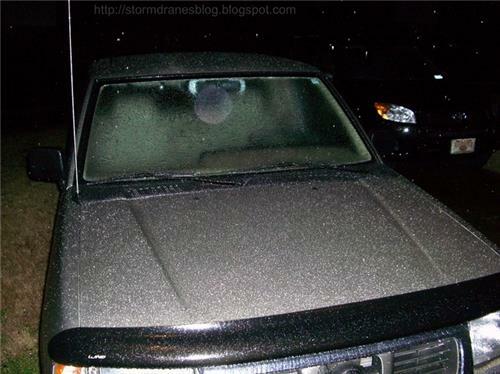 Ten people are dead across five states as a result of the storm. The system is expected to continue up the East Coast and drop heavy snow in parts of the Mid-Atlantic on Wednesday and Thursday, and the Northeast on Thursday and Friday. Follow this blog for a roundup of the latest news and a close-up provided by those experiencing the weather. Did you get your food, people of the Southeast? We've seen a number of these kinds of photos over the past couple of days -- people clearing stores' dairy, bread and other shelves. 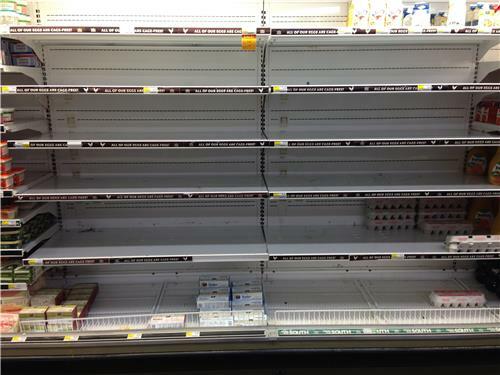 This was taken Monday -- two days before the ice storm -- at a Whole Foods store in Atlanta. Photo by Jordan Hultine/CNN. We're now at 93,000 customers without power from Alabama to North Carolina, according to officials. At least 54,000 customers are out in Georgia alone, according to Georgia Power. Up to three-quarters of an inch of ice was expected to accumulate on Atlanta and up to 10 inches of snow and sleet on Charlotte, North Carolina, making travel treacherous. Area residents had heeded ample warnings issued by forecasters, emptying grocery store shelves, filling up their tanks with gas and filling their trunks with salt. In Atlanta, the city that couldn't get out of its own way after a 2.6-inch snowfall two weeks ago, road crews were staged along nearly empty highways. Georgia Gov. 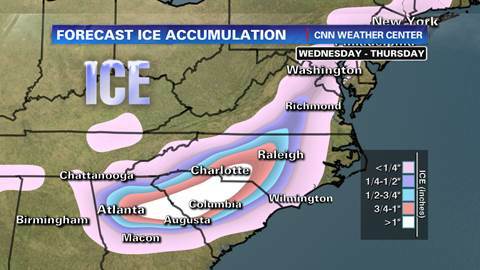 Nathan Deal is about to talk to CNN's Wolf Blitzer about the storm, and CNN will show that live. While we're waiting for that: The Red Cross said today that more than 1,000 blood drives have been canceled around the country since the start of 2014 because of severe winter weather. "If you are in a region unaffected by (this week's) storm, please consider making an appointment to donate blood or platelets," the Red Cross said in a prepared statement issued Wednesday afternoon. The weather in the Raleigh-Durham area caught North Carolinians off guard when it changed from a "non-precipitation event to heavy snowfall," the State Highway Patrol's Public Information Officer tells us. 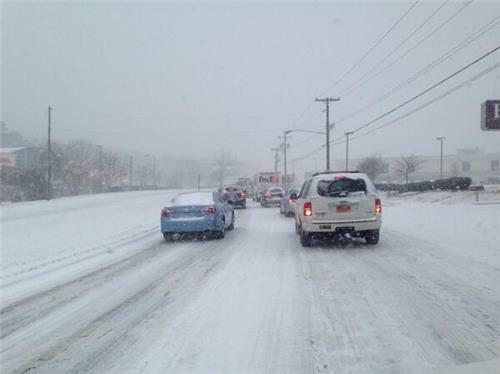 Mike Charbonneau from the N.C. Department of Transportation tells CNN’s Meridith Edwards that the state has plows and salt trucks trying to alleviate the highway gridlock around Raleigh, but they are also snarled in the massive traffic jam. He has heard of people abandoning their cars and the N.C. 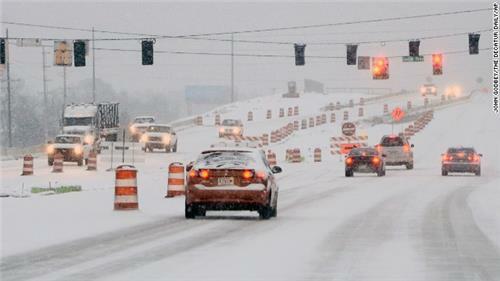 DOT is encouraging people to get to the side of the road and stay with their vehicles. 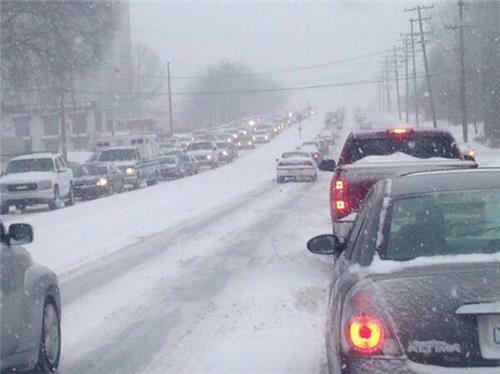 Raleigh Assistant City Manager Dan Howe just broke down the traffic situation to CNN, and it sounds eerily similar to what happened in Atlanta two weeks ago: "Everybody knew the storm was coming. We had warned people to stay home ... but the weather was pretty good this morning." Howe says that right around noon, "the snow started with a fury," and those who went to work today decided to head for home. "They all ended up on the road at the same time." Howe described a "very dangerous situation," with wind chills dipping to 12 degrees and difficult travel. "I would encourage everyone who is in a warm, safe place to just stay there." Milton Hamilton is the manager at a Holiday Inn Express in Raleigh. Drivers have been abandoning their cars on the interstates and walking to the hotel due to the gridlock and deteriorating conditions. The hotel and its nearby competitors are at full capacity, he says. CNN iReportShot taken with a DJI Phantom Drone and a Gopro Hero 3 downtown Raleigh NC. Enjoy! 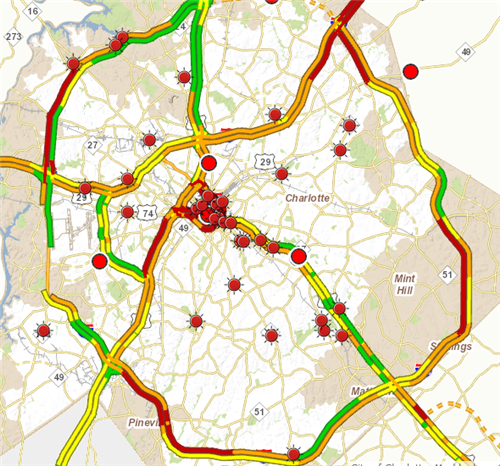 John Verdejo, who lives in the Raleigh area, said his normally 20-minute commute home took him nearly two hours Wednesday. Despite local officials sounding warnings about the coming storm two days out, much of Raleigh went to work today. "As soon as the snowfall hit the ground, it was an exodus to the streets," Verdejo said. CNNIt seems that travelers can't catch a break. This time it'll be the Northeast that takes another hit from winter storms that have pounded airline itineraries. This is how administrators at Durham Academy told students that school is canceled tomorrow. Coolest teachers ever! The Virginia National Guard says it is “staged” and “ready” to assist with snow emergency response operations across the Commonwealth of Virginia. 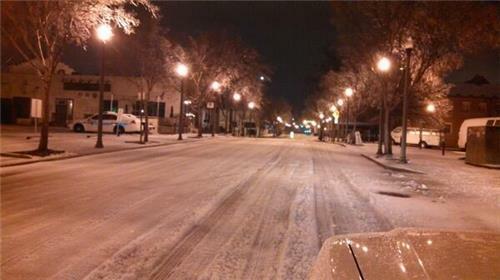 A look at the streets tonight in downtown Decatur, Georgia, courtesy of the Decatur Fire Department.